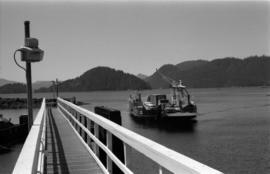 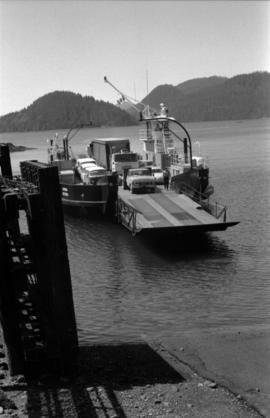 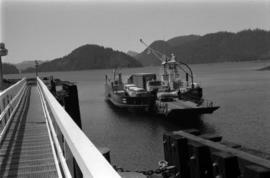 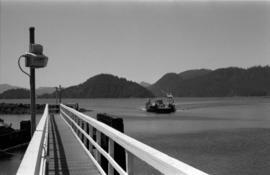 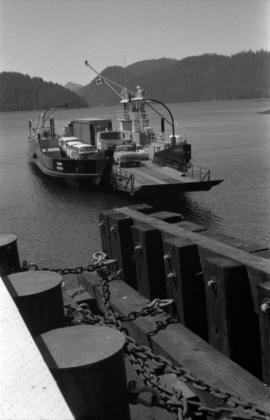 Photograph depicts two men on the bridge of the "Kwuna" ferry with car deck at Sandspit, Queen Charlotte Islands. 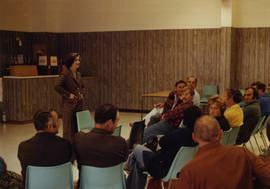 Photograph depicts Iona Campagnolo addressing a public meeting regarding communications in Sandspit, Queen Charlotte Islands. 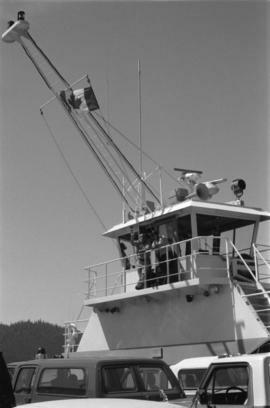 Photograph depicts Iona Campagnolo and Cliff McGinnis cutting the ribbon while a man ducks under at the opening ceremony for Queen Charlotte Helicopters Limited in Sandspit. 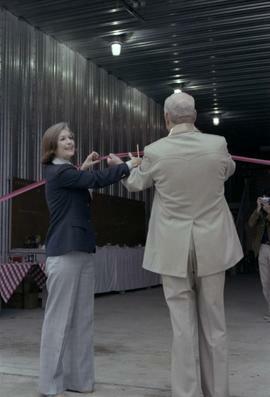 Photograph depicts Iona Campagnolo and Cliff McGinnis cutting the ribbon at the opening ceremony for Queen Charlotte Helicopters Limited in Sandspit. 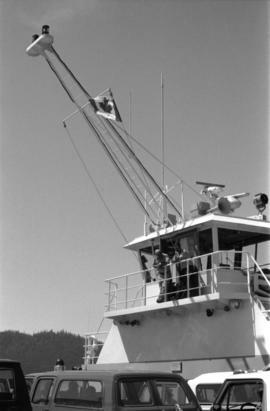 Photograph depicts Iona Campagnolo and Cliff McGinnis after the ribbon was cut at the opening ceremony for Queen Charlotte Helicopters Limited in Sandspit. 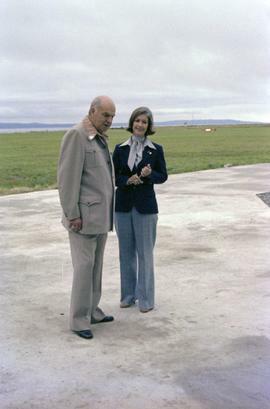 Photograph depicts Iona Campagnolo and master of ceremonies Cliff McGinnis on the helicopter pad at the opening of Queen Charlotte helicopters Limited in Sandspit. 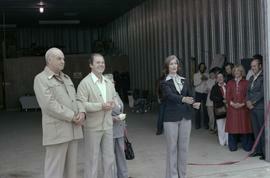 Photograph depicts Iona Campagnolo holding a present and Cliff McGinnis stand in front of the cut ribbon at the opening ceremony for Queen Charlotte Helicopters Limited in Sandspit. 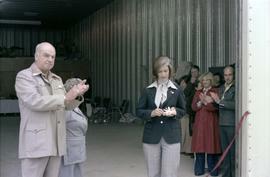 Photograph depicts Iona Campagnolo and Cliff McGinnis with an unknown man and woman at the opening ceremony for Queen Charlotte Helicopters Limited in Sandspit. 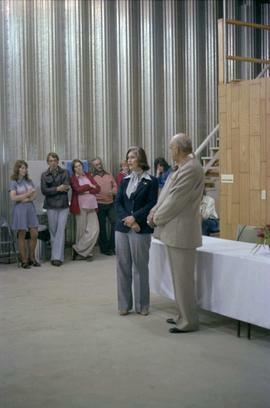 Photograph depicts Iona Campagnolo and the master of ceremonies Cliff McGinnis at the opening of the hanger for the Queen Charlotte Helicopters in Sandspit. 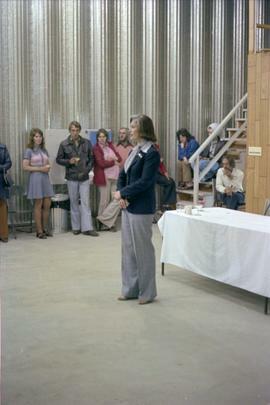 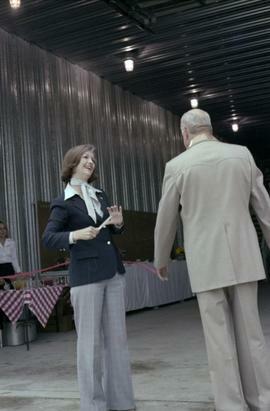 Photograph depicts Iona Campagnolo speaking to constituents at the opening of the hanger for the Queen Charlotte Helicopters in Sandspit. 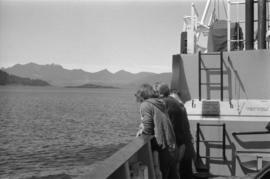 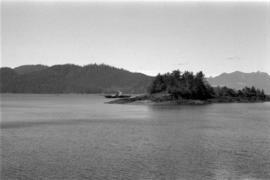 Photograph depicts four people looking at the ocean from car deck of "Kwuna" ferry at Sandspit, Queen Charlotte Islands.